Training away from the ice should be a priority in addition to training on the ice. It is important to follow a proper diet so that you can give 100 percent come game time. Getting the right food in your system throughout the day is a key to performing well once the puck drops. 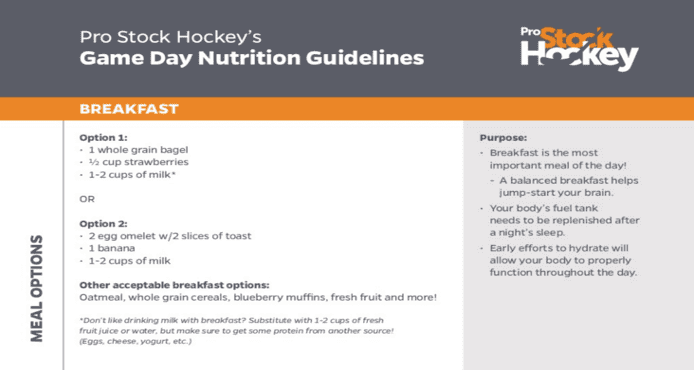 Pro Stock Hockey developed a meal guide featuring proper hockey nutrition. With a plan developed by NHL trainers and staff, it is the perfect way to convert energy from food to energy on the ice. Pro Stock Hockey, your online resource for authentic pro stock hockey equipment, has the products and accessories you need to help you get there! Our gigantic inventory of pro stock equipment includes sticks, gloves, skates, protective gear, game jerseys, practice jerseys and other NHL gear originally made for NHL players.